Atlah Worldwide Church pastor James David Manning says the messages on the church's sign are protected by free speech. 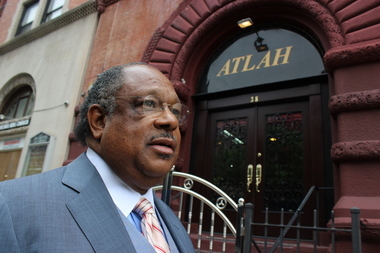 HARLEM — Atlah Worldwide Church could be fined as much as $11,500 for continuing to ignore landmark violations, said the Landmarks Preservation Commission. The church was found guilty of five landmarks violations in August. It has been served with a second round of violation notices that carry heavier fines and are scheduled to appear before the Environmental Control Board in December, according to the LPC. Atlah has not paid the original $1,825 because it doesn't have the cash, according to its pastor James David Manning. After August’s decision, the church taunted the city by writing “We won, we won, have a nice day you damned homos,” on its sign. If found guilty a second time, it could be fined as much as $11,500, according to the LPC. “If they would play by the rules of the city they wouldn’t have a problem and if they didn’t put hateful words on the board every day we wouldn’t bother them,” said Stacy Parker Le Melle, a local resident who has been organizing protests in front of the church since 2014. Atlah hasn’t filed any paperwork to correct the violations and Manning said he was not personally aware of how to go about the process. “My attorney is handling that for me,” he said. The church has consistently ignored warning letters and violations from the city's LPC. It received its first warning letter in May 2013 and five follow up letters in June 2014. All of them were ignored, according to LPC. During the August hearing, Manning claimed that he was being singled out because of the homophobic messages written on the sign.